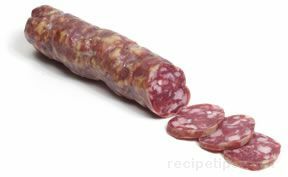 Dry Italian salami that consists of all pork meat from the head of the hog or leftover pork trimmings. It is coarsely chopped, mixed with lard, seasoned with peppercorns, lemon peel and spices, after which it is stuffed into a natural casing. It is dry-aged for over a month and should be somewhat soft when eaten. When served, it is generally sliced thin for use in sandwiches, as an appetizer with cheese, or as a topping for foods. Soppressata may be referred to as head sausage, but should not be confused with soppressa, which comes from the pork shoulder or leg.